Where can you introduce your body to the greatest core workout within 50 miles of New Canaan? Step inside The Pilates Barre, located at 35 Danbury Road in Ridgefield. No, really, step inside. 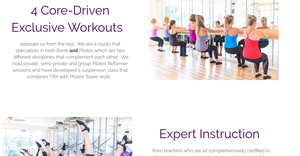 The Pilates Barre has a brand new website that allows you to watch clients in action - training in Pilates, Barre, Bodhi, and Pilates Reformer. What is Barre? How does it differ from Pilates? What is the Bodhi Suspension System? Why is Pilates Reformer rehabilitative? The mastermind behind The Pilates Barre is Sharon McSpedon who brings to her studio a culmination of three decades of teaching and training (plus, too many certifications to count). McSpedon has owned and operated The Pilates Barre in Ridgefield for eight years, carefully fusing fitness modalities, Pilates, Barre, and Bodhi to give her clients a fitness edge and a craving for more. Click here and learn more about the greatest core workout within 50 miles of New Canaan - it will rock your world.